Flowering habit Neuquén province, Argentina. 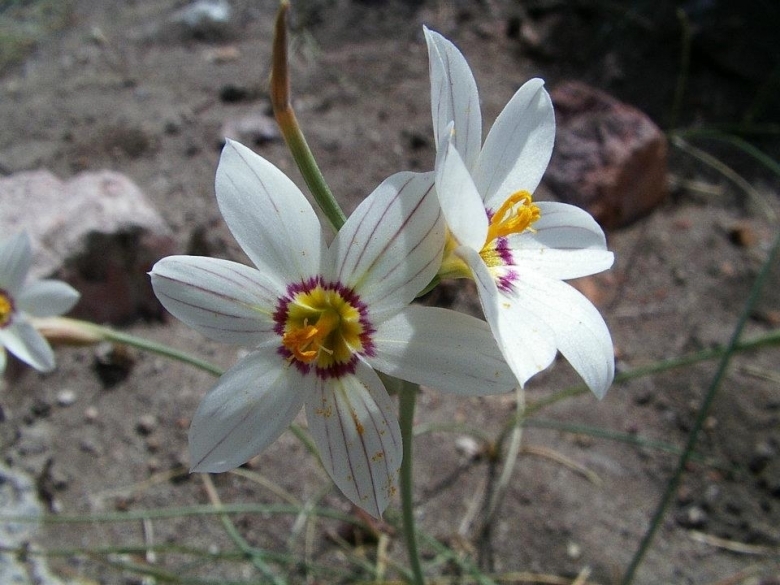 Origin and Habitat: Olsynium junceum is native to the high Andes of Chile, Argentina and Bolivia. It is found in a variety of forms over a wide range of latitudes from the Falklands and Tierra del Fuego in the south to Peru in the north, and from sea level to the alpine zone to 3700 metres above sea level. The Falklands form is white and known locally as 'pale maidens'. The extreme northern forms are said to have reddish flowers. Habitat and ecology: It grows along trail, and on steep rocky slopes of Antarctica hillside. 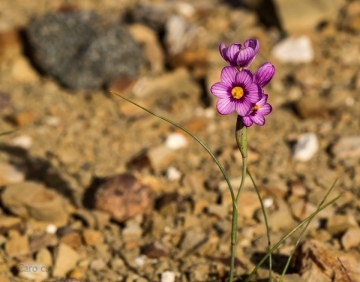 Sisyrinchium junceum var. rudis Speg. Sisyrinchium junceum subs. colchaguense (Phil.) R.A.Rodr. Olsynium junceum subs. depauperatum (Phil.) R.A.Rodr. & Martic. Sisyrinchium junceum subs. depauperatum (Phil.) R.A.Rodr. 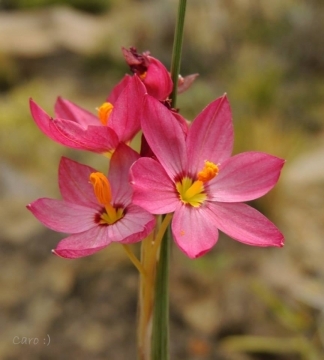 Description: Olsynium junceum (E. Mey. 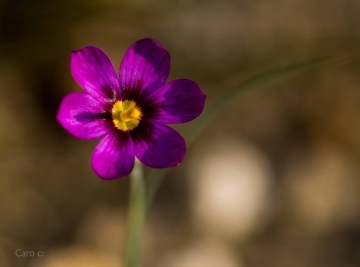 ex Presl) Goldblatt, (originally called Sisyrinchium junceum), is a beautifully delicate herbaceous perennial plant that develop a bulb or rhizome and can bloom the first year grown from seeds. It is a very variable tufted Alpine species, 5-90 cm in height (mostly about 30 cm tall), with thin, grass-like leaves. 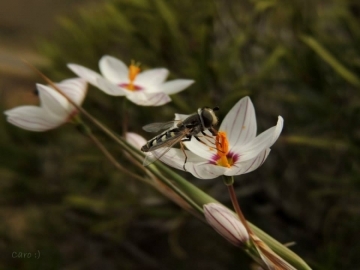 The flowers are more open than those of Olsynium filifolium, and can be white, icing-pink, rose-pink or reddish-pink with magenta or purple stripes on the back of the petals. Note that the flower stalk emerges from a long terminal bract, and the individual flowers emerge from a second long bract, each on its own pedicel. Leaves: Thin, wiry, stem-clasping, mid-green. Inflorescence: Stem simple cylindrical furrowed up to 70 cm high (much shorter on higher mountain) sheathed below the leave. Spathe very long half as long as the stem, flowers stipitate numerous: Peduncle very long smooth having at the base of each a scarious bract one third the length of the peduncle. Flowers: Flowers, open bell-shaped, less than 2.5 cm across, with tortuous stalks issuing out of the spathe, at the top of which are three lanceolate scales (involucres) with scarious edges, which enclose a portion of the peduncles. Perianth white, icing-pink, rose-pink or reddish-pink with green or yellow spots at the base, sometimes veined. Perianth lobes six and equal, lanceolate apiculate. Filaments joined, inflated in the middle. Anthers not joined subsagittate of an orange colour. Style divided into three portions towards the top. Stigma minute entire. Ovarium somewhat round hairy, situate below the perianth, being triangular, three celled and inferior, each cell containing two seeds. Blooming season: Flowers from mid-spring to early summer. 3) Goldblatt, P., Rudall, P. and Henrich. J.E. 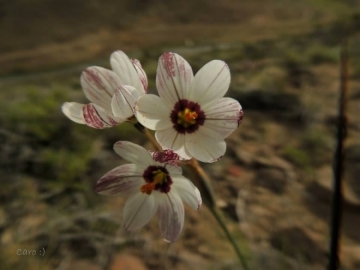 “The Genera of the Sisyrinchium Alliance (Iridaceae: Iridoideae): Phylogeny and Relationships.” Systematic Botany, Vol. 15, No. 3 (Jul. - Sep., 1990), pp. 497-510 1990. Cultivation and Propagation: Olsynium junceum one of the most frequently grown. It is probably the easiest of the genus to bring to flowering and one that gently self-seeds. It is certainly a beautifully delicate plant that merits extensive cultivation its blossoms being abundant and continuing for at least two months. Lots of light and good drainage are a must. Soil: It should be potted in a mixture of peat sand and loam and protected in a cold frame. Water: Do not over water. Maintenance: Deadhead the flowers and only keep the seed pods you will require for further propagation of your olsyniums. This will prevent the rhizome to age too soon. Use: They make superb rock garden plants, as well as adequate for the front of a border as well as being perfect for pots and containers, where they will be more reliably perennial, multiplying up yearly. Propagation: It may be propagated by offsets and probably by seeds. Sow them during autumn, in a mix of equal parts of compost, regular garden soil and sharp river sand. Cover this mix with a layer of sand, distribute the seeds and spread some more sand over them to barely cover the seeds. Place your sowing pan in a cold frame or cold greenhouse if you have heavy rain in your area. If you have snow, place the sowing pan outdoors and let nature do its work. The seedlings can be transplanted once they are 5cm tall. These pretty plants can bloom the first year grown from seeds, but will display their best from the second year on.